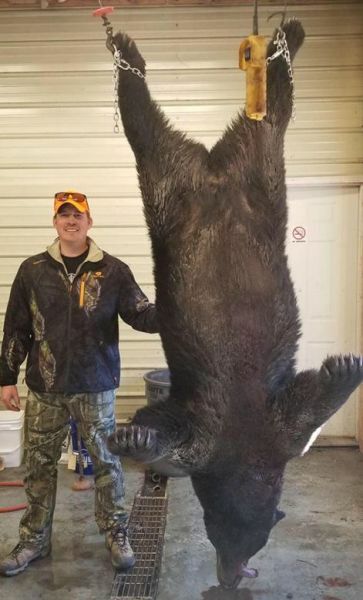 Matthew Griffin of Clayton, N.C. was deer hunting with his dad on Nov. 17 when he killed a 616-pound black bear in Craven County. And he had passed on shooting a different bear earlier on the same hunt. “Deer and bear season overlap briefly in this part of the state, so we know there’s a chance we’ll see some bears and are ready for them if that happens, but we were mostly deer hunting,” said Griffin. The two were hunting out of separate stands on a hunting club that’s mainly made up of dog hunters, but they still hunt, and were on a different piece of the club than the dog hunters were that day. About 30 minutes after daylight, Griffin got in his stand and saw a black bear of about 150 pounds. The bear walked in and sat down about 30 yards away from him. He didn’t want to shoot the bear because he knew some bigger ones were around, and he was also still hoping to get a shot at a good deer. After a while, the bear got up and went on its way. Not long after that, Griffin heard dog hunters on the other side of the woods, and within a couple of hours, he texted his dad to see about moving to another part of the hunt club away from all the ruckus of the dogs. “We got in the truck and talked about where else we could go to get away from the dogs. We drove to another part of the hunt club and dad pointed into a clearing and said ‘look at that deer,’ and I could see a deer running, and not far behind it was a big bear,” said Griffin. The bear was quartering away and heading for a wooded area, and they drove to a spot in hopes of intercepting the bear before it disappeared. Once his dad stopped the truck, Griffin got out and found the bear in his crosshairs. “It was about 60 yards away and moving, and I felt comfortable with the shot until the bear slammed on the brakes. It kind of skidded or slid like it was running on ice, then ran away from us. I told my dad I wasn’t going to shoot it unless I had a clean shot,” he said. But Griffin kept his Browning .300 Win Mag rifle at the ready, hoping the bear would give him another shot opportunity. “When it got about 90 yards away, it stopped and looked back at us. I shot it in the neck, and it dropped. It tried to get back up a couple of times, but finally fell for good,” he said. His taxidermist is making a shoulder mount, and said he believes the skull will score high enough to put it in the Boone and Crockett Club. Griffin said the hunt was extra special because after living out-of-state for 14 years, he’s finally able to share experiences like this with his dad. “Being with my dad on that hunt definitely made the memory of a lifetime for me, and we also got the bear of a lifetime. That means a lot to me,” he said.